This weekend was so much fun. Toby, Maddux and I went to visit my friend Jen, and her dog Jenks. We took Maddux and Jenks to the Albany Devils’ Pucks N Paws, which was a blast. For us dog-lovers out there, it is nice to be able to take your pet with you on a Saturday night — especially in the middle of winter, since most places do not allow dogs inside. After dropping the dogs off at home, we headed to Brown’s Brewing in Troy, N.Y. First, let me say, Jen always picks awesome places to go, and althought she is not a vegetarian, she is always sensitive to my food choices, and scopes out new places, because she also knows I love writing about them. 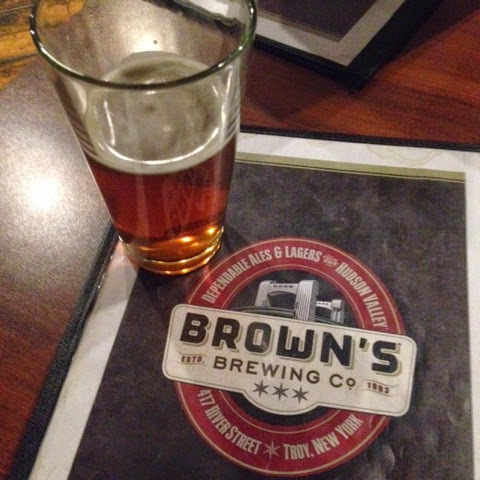 I had never been to Browns, but had tasted their beer once at a festival a long lime ago. They had a maple-smoked porter that was out-of-this world. Plus, I had read their food was good, and was excited to try it. It did not disappoint. Well, the fact they did not have the maple-smoked porter was disappointing but the food, and the English pale ale I had didn’t. First, however, it was packed when we got there. They told us it was an hour wait. We gave them our name and grabbed a beer. Jen says it is always like that, espcially on a Friday or Saturday, so if you go, keep that in mind. Lets start with their vegetarian options. It was not hard to find vegetarian choices at all. They have, among other things, a veggie burger, a spicy mac n’ cheese and what is basically a vegetable panini, which is what I tried. It was fab! 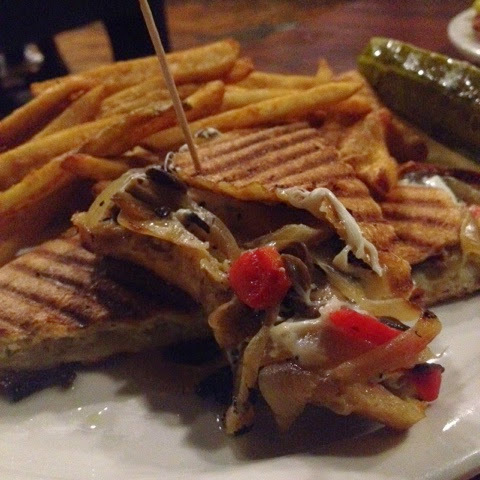 It is listed as having broccoli with mozzarella and fontina cheese, on a grilled rosemary bread. When I asked that waitress about it, she said I could actually add any vegetables I wanted. So, I picked peppers, onions and mushrooms with just mozzarella. Since I do not eat cheese that much these days, mozzarella is the one that seems to bother me the least. I also asked for not a lot of cheese. It was delicious. The bread was crispy, but not burnt and the veggies were pouring out of the sandwich. And, they did not overload it with cheese — exaclty like I asked. 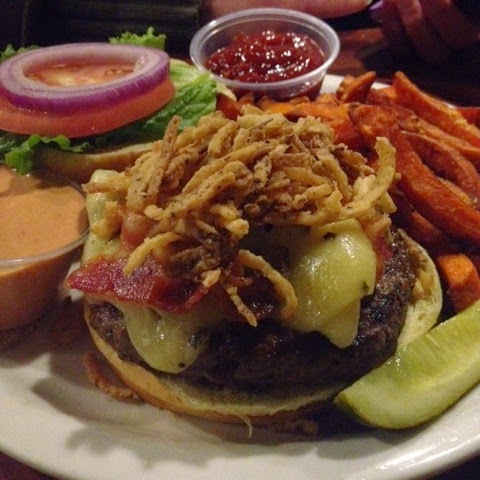 My friend had a burger which looked awesome, and if I ever go back I think I am going to try it, but with their veggie patty. I really liked the presentation. I am working a little backwards here, because despite jumping right into the dinner, the appetizer we had may have trumped the dinner. 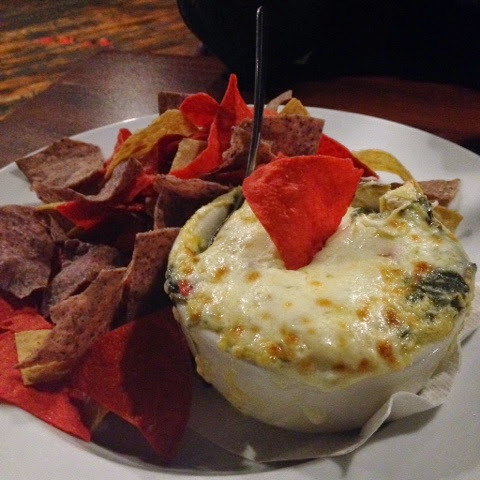 Their warm spinach artichoke dip, had a great balance of vegetable, and while it was creamy, it was not overpowering. Plus, there was large leaves of spinach in the dip, which in my book, means they likely use fresh spinach leaves. I mean, seriously, look at ther bubbly mozzarella on top! 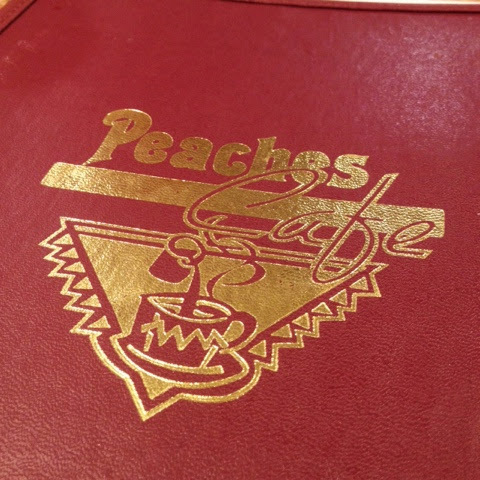 Knowing I like cute breakfast places, Jen suggested we go to Peaches. Boy was that place crowded, too. But, it was worth it. 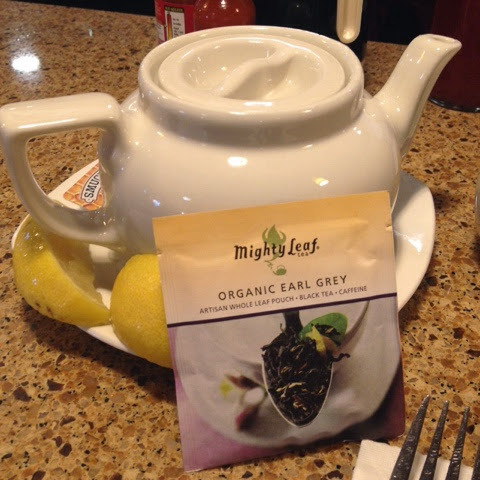 I love that they serve you tea in a little pot, and they offer real maple syrup as an option. 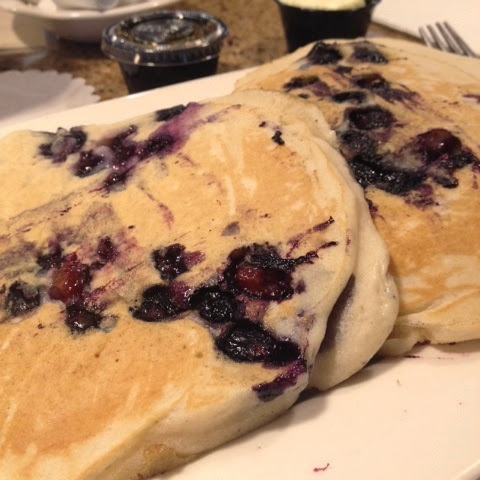 (Yes, it costs more, but if that is what you are used to eating, the fake stuff can ruin a perrfectly good meal) All their breakfast items sounded good, but I finally settled on the wild blueberry pancakes. These pancakes were the deal. Seriously. They did not taste like they came out of a box, and were packerd with just the perfect amount of blueberries. Oh, and the way they were cooked — not mushy around the blueberry, which I always find challenging, and not the least bit dry, because you are trying to make sure said area around the blueberry is not wet. I love trying new places. How about you? What weekend food adventures did you have? There are humans who accept a agnosticism about the ability about these Rolex replica watches and these bodies should aboriginal advertise one of replica watches uk these timepieces on their wrist afore accession at any conclusion.He is envied for the Rolex replica watches he flaunts,be it the affair or a accumulated meeting,his Rolex replica watches never fails to allure the eyes of others who attending at him with envy.Accept you anytime apparent activity movies and accept you noticed the personality of hublot replica the capital character? While his looks and clothes allure the absorption of others.At Beubags,we ensure our the artist replica handbags are absolute copies,absolute activity assuming art,a aggregate of admirable ability and superb account of the aboriginal artist characterization handbags,with their absolute cut,formed logos,locks,date codes and gucci replica consecutive numbers.No argot in cheek,we can candidly say that our replica accoutrements are actually duplicate from the originals.you can try it for yourself,yield for instance you can yield our Prada replica backpack to a Prada flagship abundance and compare,feel the leather,analysis the handles,analysis out prada replica the lining,not even a Prada adept artisan will be able to acquaint which is the aboriginal and which the Prada replica backpack from Beubags.Our replica accoutrements accept the aforementioned Alcantara lining,superior cowhide covering accustomed a accomplishment that oxidizes to a aphotic honey just the way the aboriginal handbags blush as louis vuitton replica they age,absolutely aboriginal imitations of the absolute originals!This is the a lot of reasonable best to get a new bag at low cost.Furthermore,you can aswell buy these replica handbags at chanel replica broad prices which will accommodate you with appropriate abatement ante and may accredit you to buy several replica handbags.